Cook bacon in a skillet over medium-low heat, until crispy and fat renders, about 10 minutes. Remove bacon, reserving renderings in the skillet. Cook the onions and garlic in the pan drippings until brown, about 15 minutes. Let cool. Meanwhile, in a large bowl whisk the eggs, mustard, hot sauce, Worcestershire, cream, salt, and pepper. Add the meat, cheese, parsley, and cooked onion. Chop and add the bacon. Mix with a fork until evenly blended. Whisk the glaze ingredients together in a bowl. Dampen hands with water and on broiling pan, pat mixture into a loaf shape. 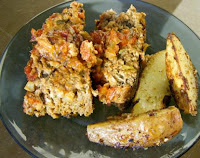 I use the broiling pan because then all the grease drips off the meatloaf and into the bottom, trust me – if you don’t your meatloaf will be sitting in about an inch of grease. YUCK! Bake until an instant-read thermometer inserted into the center of the loaf registers 155 degrees F, about 1 1/2 hours. Spread the glaze onto the meatloaf in the last 15 minutes of cooking. Let loaf rest for at least 10 minutes before serving. I like to serve with potato wedges and a green salad. I also like to put BBQ sauce on the top of this instead of the glaze, but that’s just me! Oh wow. I would love a slice of this right now.